Cilantro haters have been vindicated. The New York Times recently ran a story: Cilantro Haters, It's Not Your Fault, in which Harold McGee, respected food scientist and author, explained why cilantro really does taste like soap to many people. According to experts from flavor chemists to neuroscientists, some people "may be genetically predisposed to dislike cilantro." Turns out that cilantro's aroma is created by fragments of fat molecules called aldehydes. Flavor chemists have shown that "the same or similar aldehydes are also found in soaps and lotions...."
So cilantro-haters are not crazy after all. But what about beet-haters? Why do so many people say beets taste like dirt or metal? Is it chemistry? Canned beets? Craziness? Mention beets and people react extremely. Lovers wax that beets are as sweet as sugar. Haters wane that they're dull as dirt. Literally. This could be because they failed to properly clean their beets and ate dirt, which studies have shown tastes like dirt. President Obama famously banned beets from the White House garden. What about the metallic taste in beets? Lots of people blame the metal can, which studies have shown tastes like metal. But that doesn't explain why many people say fresh beets taste like metal. Perhaps it's iron. Beets are high in iron, which is why they're recommended for people with anemia or for menstruating women. I'd like Harold to do a piece on beet haters next. Someone needs to get to the bottom of this enigmatic vegetable, and clearly it isn't going to be President Obama. In case you haven't guessed already, I am a beet lover. Although even I admit that sometimes beets taste a little like dirt, or as we foodies like to euphemistically say, "earthy." My friend Karen of Family Style Food said it best:"I think they do taste like dirt but with sugar on top." So, tell me, dear readers: Do you like beets? 2. 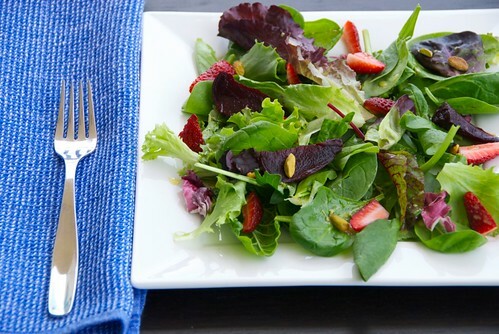 In a large bowl, toss mesclun, strawberries, and beets. 3. In a small bowl, whisk all vinaigrette ingredients. Taste and adjust accordingly. Pour over the salad and toss well. Garnish servings with toasted pistachios. I haven't ever eaten a beet. I dislike most veggies and just figure I would hate it, too! I love beets! But only within the past year or so - prior to that I had tried them a few times and really not liked them, so I think my taste buds grew a bit. I recently served a beet risotto at a dinner party and I was a little nervous since I know they're so polarizing, but surpringly, most of the people who thought they didn't like beets really enjoyed it! Perhaps it was the fontina and crispy pancetta in there. Cheese and bacon make everything better, right? I really want to like them and have tried them over and over again but I just can't enjoy them. They have a funny taste to me. Beets are one of my all time favorites! I literally fought with the caterer at my wedding to have beets represented. Her reasoning was that "no one eats beets!" My reply, "I do! My family does! This IS something I will become a bride-zilla about." And I got beets. Beet greens are so fantastic lightly sauteed with garlic and olive oil, or served raw in a nice salad. Beets are all-around workhorses, creating flavorful dips for crudites, cold salads, hot sides and delightful pickles and relishes. If you don't like beets one way, try them another. cara-Fontina and crispy pancetta have a way of making even beets seem seductive. I think it's true though. If you approach a food with an open mind, you'll often find it's not as bad as you think and that you may actually like it! rockies-Hey, at least you tried! And at least you love cilantro. That definitely helps! michele-You stained the wallpaper? That's hysterical! I actually like pickled beets. Of course, I like just about any vegetable pickled. I will check it out. Thanks! simona-I wish you could come over for lunch! Really, I do. they do taste like dirt with sugar on them..but that's what i like about them...i hate their staining everything they come in contact with! I'm one that loved them from first bite! Really good when roasted & eaten with salad like you did here, beautiful btw. I am a beet-hater. I am in my 50's and over my life, I've had them every way you can think of, from borscht made by my old-country mother, to sides prepared by some of the best chefs. I've never had a canned beet. And they taste like dirt. Bleah. I love beets!!!!! I mean that beautiful, red gem grows in the ground!!! Still amazes me. I categorize people in two groups: Cilantro-lovers and cilantro-haters. I try to be understanding, but secretly I distrust the haters. There. I said it. Then there's the people who don't like avocado and I can't even think about that for two long because it makes my brain hurt. Beets took me a while, but now I really like them. I just posted an awesome warm beet recipe with shallots, chard, and fancy cheese that I devoured! My husband still sticks up his nose at them -- more for me! Put me in the LOVE category with beets. That wasn't always the case, but I have to say I'm just counting the days until the CSA harvests our first crop of beets. I even got to plant the seed this year, so I think they will taste extra special! I love beets! They're high in sugar though so I do eat them kind of sparingly. I have a sister who hates them with a passion, so when we go to one of our favorite salad places, she gives me her beets! I love, love, love beets! I like them plain, in the rain, on a train, not down the drain. I love them grated, plated, inundated...love em. I fall in the beet-convert camp. Never a fan of their dirt-like favor, I have admired them from afar, seduced by their gorgeous colors. So, little by little I have sampled them, beginning with golden beets, which are milder, then moving on to the big bad red beets, which I now enjoy. Usually. I LOVE beets, adore beets, wish I had a beet salad right this minute. There are some preparations I don't particularly like, for example, the diced beets in a thick sweet cornstarchy sauce the cooks at our school lunchroom served at least once a week the entire twelve years I ate there. Generally, though, I believe beets are our friends. I'm a cilantro hater who loves beets! My favorite way to cook is to roast them in a bit of orange juice, which brings out the natural sugar. I've been preaching about the wonder of beets for years but it seems there are just so many people that remember having to eat pickled beets, that it seems futile at times. To me, they are one of the easiest vegetables to grow and, when steamed & eaten with butter, salt & pepper, the taste is absolutely divine. I'm GROWING to like beets. I had a somewhat traumatizing experience with some canned beets when I was younger and so I've been slow to really appreciate this vegetable. I'm getting there though! The salad looks delicious. Love beets - but not beet tops. They're best when they're fresh, not canned and I love them hot, cold, anyway at all. The salad looks delicious. We LOVE beets! Have two rows of them (red and golden) in the garden right now. Love, and have always loved, beets. Love them hot, roasted in the oven; love them cold, in salad with vinaigrette. In recent years I have discovered yellow and orange beets, which I also adore. I've also started cooking with the greens - they are really divine. I love beets, and I do agree that they taste "earthy". I would have never thought to include them along other sweet fruits and stuff in a salad. Yum! I absolutely LOVE beets, particularly roasted beets, and am thrilled they're in season again! I LOVE beets, even as a child I think the first solid food I may have eaten were pickled betts. I figure folks who don't like beets haven't had them cooked right. I got my beet-phobic family to try these delish root veggies in a salad with field greens, cara cara oranges, hazelnuts, and goat or feta cheese, with a chiffonade of mint -- & they're hooked. Love the look of your recipe too. I adore beets. But I only recently realized it. My Mom hate sthem, and I guess I never had them as a kid because she didn;t make them. So somehow I just assumed they were bad. How wrong I was! And I love that you pair them with strawberries here! Love love love. My husband is on the other side of the fence, though -- but I suspect he was scarred from a childhood of only encountering canned beets. I love beets -- just about any ol' way. But I just planted them for the first time in my garden this year. Hoping for the best. i love beets! they're the first thing i get every year for my garden. personally, i like the "earthy" metallic flavor, though i've found that it's harder to detect once it's been boiled. Love beets Susan! Especially your salad! caroline-That's what a love to hear! stacy-That's the spirit, my girl! tw-I bet you are waiting eagerly with many delicious ideas. Enjoy! sean-That is odd, but a good odd. Mums the word on my end. melly-A commenter who rhymes? That's just cool. meredith-I'm surprised you still love beets after having that awful school lunch. Clearly, you're a very smart girl. joanne-You hang in there, girl! snooty-I have never grown them, but I sure would if I had a garden. They're really versatile. linda-I'll take the tops then. I love 'em. tripleb-Aren't all the various colors just sublime? I adore the greens too, especially with pasta and a cream sauce. tasteatsathome-Then I hope you try it! kim-I love the golden one too. They're even sweeter and usually more tender. kate-I could never forget the greens. Ever! :) The chiogga are so appealing -- the eye candy of vegetables. val-You must have made your mom so happy! sarah-Well, that recipe you shared would convert any beet hater! Seriously. That sounds fabulous. serena-Gee, I don't know. My husband and my dad love them! foodietots-He's one of many, unfortunately. karen-That's funny. Sounds like something I would have done as a kid. Too bad about your husband and the cilantro, but good for you! rosemary-Let me know how they turn out. That's exciting! Thank you so much for your kind words. jenni-I love how invested you are in making sure your kids eat a variety of foods. It's so important to introduce them to many foods at a young age. d-I never boil them. I always roast them, and I don't taste any metallic flavor either. Now, I'm really wishing I had a garden! I have to admit... beets scare me. I've never known how to handle or cook them! BUT with your instructions in hand, I just might tackle it because I actually do know that I like the little guys... especially in the salads I used to have in Dijon, France... laced with some light mustard vinaigrette (memories). I love beets. From a hearty borscht in winter to a spring salad featuring jullianed beets with roasted walnuts, mint and raspberry vinegarette to old fashioned canned, can't go wrong to me! I don't like beets, but I don't think they taste like dirt or metal. I just don't like the way they taste. But I'm picky, so no one should listen to me. I love "new" beets...the smaller the sweeter. a great opportunity in his own back yard! I am one of those soap-mouthed cilantro haters, but love the beets. No comparison. Beet-haters are just big old babies. I adore beets. Fresh, tinned, roasted or boiled in borscht-love them all. I can't think of a better lunch than a slice of sourdough rye bread with sour cream and sliced beets-the best. Besides, if you don't eat tinned beets, where do you get the juice for your pickled onions and eggs? Alas, I live with two beet haters. Fools. I adore beetroot! Perfect roasted, peeled and tossed through with fetta cheese, lemon juice and toasted cumin seeds. When the first of the beetroot is in the markets and the weather is still cool I make borscht (the Russian beetroot soup). I've even been working on an idea for beetroot caramel (it's a long story ... any ideas welcome). I love that - dirt with sugar on top! I love beets, and am planting some tomorrow. Love beets!! My fave is roasting, but sometimes I will just boil 1 or 2 cool and slice them and make a sandwith with sliced sharp cheddar cheese. Yeah, sounds nutso, but really good. Beets are like liver...They are something that I know is good for me, but.... That said, I have eaten beets that were added to a chocolate cake before and they were fine. But maybe that is because anything tastes better with chocolate? I love beets prepared any way. I received them in my CSA box and roasted them with other root vegetables and to my amazement they were delicious! This is such a cool & lovely new way to enjoy spring beets! I so love beets! I have a few recipes on my blog too! i love them in spring & in wintertime! Oh, how I love me some fresh beets :) And that salad looks glorious! I just saw a recipe for "beet chips" that I'm dying to try out! I love beets, greens and all. Beautiful salad! I love beets but hate cilantro...interesting! I will admit I do not know how to prepare fresh beets. I LOVE BEETS!!!! Love them nearly any way. My kids do not. Nor does hubby. 1-I buy a bunch of beets that has beautiful greens (or we get it in the CSA). 2-I grate a couple of the raw beets into a carrot salad. Grate about 1 beet for every 2 carrots, adding lemon juice, bit of olive oil, bit of salt. My daughter will eat an entire bowl of this! 3-The next time the oven is on, I wash the rest of the beets, wrap them in foil (hmm... should I be using parchment? ), and throw them in the oven. Leave 'em there awhile. Then I eat them, 1/2 to 1 per day 'til they're gone! joanna-It's true. They don heat up the kitchen. Stay cool. anonymous-Well, that's great. I have tried to like borscht, but so far, we're not friends. anonymous-I bet you're right! I love dill on beets as well. Dill seed too! miss anne-Beet root caramel? Really? I'm intrigued. anna-Hope the planting went well! claudia-Sweet as candy! Really. Thanks for the kind words. george-Nutso? Maybe. But my husband would like that. Or even with blue cheese. jessica-Yes. Everything DOES taste better with chocolate. teachercooks-They do get along well with other root veggies, especially drizzled with maple syrup. sophie-I'm glad you like it! sues-I want to make beet chips too. Love those crispy little guys! maria-I love the greens too! sarah-You can just simply roast them as I did for this salad and drizzle with olive oil, salt, and pepper. You can roast them and drizzle with a horseradish cream, a honey-mustard vinaigrette, or blue cheese dressing. Just experiment! They're delicious! stephanie-I love your #2 idea! I'm doing it this weekend once I buy my fresh beets. Really. That sounds so deliciously crunchy. And I do #3 all the time too. Chilled roasted beets make a wonderful snack. Do I? and how. Let me count the ways I love beets, borscht, beet chips, canned in a vinegar brine, flavoring eggs... being the Polack I am, I guess it runs in my blood. As a kid I hated them- tasted like dirt.